Description of "Dahej Todi Rishta Jodi (eBook)"
This book is written in Bhojpuri language (local language of Bihar) which is basically based on the dowry system. He is a retired army officer from Bihar, now he is focused on his writing skills. 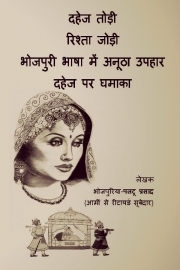 This book depicts the concerns of the dowry system prevailing in Bihar. Reviews of "Dahej Todi Rishta Jodi (eBook)"